We have returned to All Japan for the Raising an Army tour as it’s expected to be a big show tonight. We have three title matches planned with one of them being considered unpredictable due to Zeus and Kento Miyahara involved which could change the course of how AJPW will be within the next year. After this show, we got the tag league coming up on November 11th and I will be covering that one while I take my break from Stardom until their tag league is over. Got a stacked card from top to bottom and now it’s time to see if it’ll deliver as we…dive right in. Review: Our opening match is a singles match with the returning Yusuke Okada taking on Atsushi Maruyama. Around April, Yusuke would suffer an injury that would leave him sidelined for about six months until he made his return a couple weeks ago with his stable, Evolution. Will Yusuke get a singles victory or will Atsushi get the win? The match was pretty much very basic since Yusuke is slowly getting into the groove of things after being gone for so long and has an easy opponent to work with also. Yusuke has done rather well for himself in the match while Atsushi did well helping him out to give him a smooth match and to get the crowd warmed up. Nothing really big happened in the match, but Atsushi would go for a Fisherman Buster but Yusuke would break out of it and Atsushi would try to do a Roundhouse Kick till Yusuke ducked both of them and quickly rolled him up for the pin. Review: Our next match is a six-man tag match with Ultimo Dragon getting involved with his partner’s SUSHI and Yutaka Yoshie as they take on Black Menso-re (aka Yohei Nakajima), Masanobu Fuchi, and Takao Omori. Menso-re is someone who has been pretty impressive when Yohei had this new persona and it’ll be interesting to see where it’ll lead him. Which os these two teams will win? Let’s find out. The match really had nothing special to talk about when it comes to the in-ring aspect of the match, but it was pretty entertaining with the comical humor they would have here, especially with Mens0 and SUSHI at the beginning of the match when SUSHI would fail to jump onto the ropes due to him slipping each time he would. Fuchi would get his pop with the whole open hand gesture with the referee which still goes over well and is still funny when you watch it. Nothing wrong with small humor in a match when it’s not over the top and they do that part just fine here. Ultimo and Fuchi are in the ring now and once Fuchi missed the Dropkick, the crowd would just boo, they really do care for this guy still. 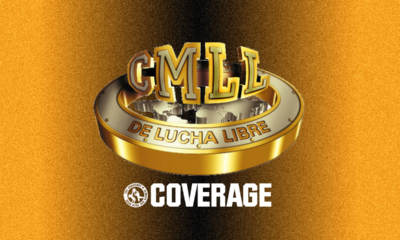 Ultimo would hit the La Magistral in the match on Fuchi as he would get the win for his team. 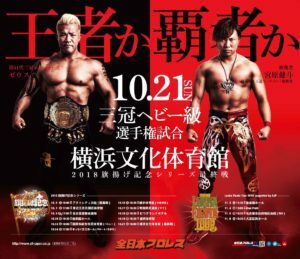 Review: We got another six-man tag match this time with our current All Asia Tag Team Champions, Naoya Nomura and Yuma Aoyagi teaming up with Yoshitatsu as they take on KAMIKAZE and Evolution members, Hikaru Sato and Atsushi Aoki. 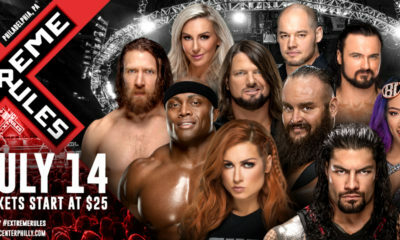 This is just another tag match to get some people on the card but if Evolution could get a win over the champions, then we could possibly get some new contenders. Which team wins? I really enjoyed Yuma in this match and his interactions with Aoki and Hikaru as they were both solid sequences. If Yuma wasn’t considered a heavyweight, I would say that he would fit in pretty well with the junior division and could be someone to help elevate it. I thought the match was solid as the majority of them would have impressive performances, especially Yuma and Hikaru who has some very nice kicks that match his style. Yoshi didn’t do too bad either while still being inconsistent here and there, but his interactions with KAMIKAZE wasn’t bad at all. The one big thing that would hurt the match was the ending as Yuma would have Hikaru down on the mat for Nomura to go to the top rope so he could hit an Elbow Drop and go for the cover as he got the three count while he kicked out at the same time, but the referee would still call it as the finish to give Nomura the win. I don’t think that was the actual finish, but there’s nothing they can do about it and gotta play it like it is, unfortunately, it happens. Review: We have a regular tag match this time as Joe Doering teams up with Black Tiger VII to take on two members of Sweeper, Koji Iwamoto, and Ryouji Sai. I was expecting Dylan James to be Joe’s partner but it looks like he already has a match later on tonight. Dylan would betray Sweeper to join Joe Doering as the two would be teaming up together after their little encounter during the tournament. Now it looks like Sweeper would want to get revenge on Joe, but can they do it? Joe looked like a beast here and I did say before that when he actually does look like he’s trying his hardest in his matches, he can actually go and give us a solid performance and he does that here when he overpowered both Koji and Ryouji in the match. Black Tiger is still someone that gives us an entertaining performance while still showing how agile he can be in the ring when he was wrestling with Koji during the match. While the pacing felt a little bit off in some areas of the match, the story of it was easy enough to follow and understand the brief scenario of Sweeper and Joe. Just seeing Joe manhandle these guys with his brute strength was alone enough to get that heat with the crowd while Tiger just did his little dance like he snorted a lot of cocaine before the match and is just getting jiggy with it as he hits a Shining Wizard. Ryouji would have Joe held down to the outside while Koji would get Tiger into the European Clutch for the three count as Sweeper would steal a victory! Solid tag match and curious to see what’s next, maybe Joe and Dylan fight them next time. Review: Our next match is our first title match of the evening as the GAORA TV Championship is on the line as TAJIRI is set to defend the belt against Freelancer, Chikara. What’s the GAORA TV Championship, you ask? Well, it’s a title that was planned by AJPW and Gaora TV in 2012, so it’s still fairly new to the company and has been getting some feedback from being about comedy or wrestling, kinda like the Open the Owari Gate Championship, but without the voting after the match. Will TAJIRI get his second defense in or will we have a new champion? I was expecting the match to be a lot more comical than anything else, but I was pleasantly surprised to see that it was treated as a regular wrestling match. This was my first time seeing Chikara wrestling and I gotta say that I was pretty impressed, and despite his goofy little outlook and facial expressions, he’s actually not bad in the ring at all. The two would fight outside for a bit and it looked like Chikara had an opening after delivering some chops, but TAJIRI would find a way to outsmart him as he moved out of the way of the next chop which caused Chikara to hit the turnbuckle post, injuring his arm as TAJIRI now has a body part to work on. What did you think was going to happen when you let TAJIRI stand still for you so you could hit him? TAJIRI would start to take advantage of his arm in the match while still outmaneuvering Chikara in the match, but Chikara would be able to get a bit of a comeback during the match and get the crowd behind him. Despite his bad arm, he could climb up to the top rope and starts to call for the end as he jumped off the top to deliver a chop to TAJIRI’s head while TAJIRI tried to catch it before it would connect, but it was too late as it hits and TAJIRI goes down. Chikara went for the pin and TAJIRI kicks out but he would quickly turn it into the Kimura Lock as TAJIRI has it locked in tight while Chikara has nowhere to as he has no choice but to tap out and TAJIRI retains the title. Review: We now have a singles match with Dylan James taking on Jake Lee. This would be his first singles match as a heel after leaving Sweeper and now one of the members, Jake Lee is set to fight him to try and teach him a lesson. Jake has been slowly building momentum as a singles competitor and this could be another step for him if he is to win the match against James. Will Jake Lee avenge Sweeper or will Dylan knock him down a peg? James would take the fight to the outside with Jake as he would get the early advantage until Jake would turn it around and would throw him into the guardrails and knee him around until he brought him back inside of the ring. Once they were in the ring, this is where James would start to have control of the match once again as he would just destroy Jake with his chops and just beating him down. James would even have him on the turnbuckle and just force his shoulders into his stomach over and over again for quite a while and would only stop if he felt like he was out of breath and do something else to torture Jake. 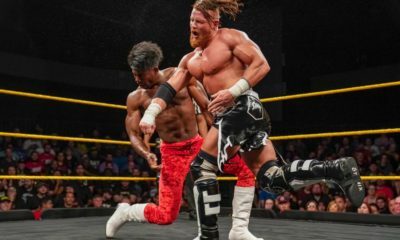 James would then use the Lariats into his arsenal now and delivers a stiff one but Jake would kick out of it at one until James would use this opportunity to go for it again to knock him down, but Jake still kicked out at two this time around. It looks like it would be the end of the match as he calls for the Chokeslam to end it, but Jake would reverse out of it by kneeing him in the face and it would be the same pattern for a couple more times until James would fall down on the mat. Jake would get back up to pull his kneepad off to have his knee exposed as he ran towards Dylan for another knee strike and he’s knocked out as Jake pinned him for the three count! This was a very solid match between the two and Dylan has impressed me during these past couple of months and I hope he continues to grow better from here. Review: We get our second title match for the night as the Violent Giants defend their Tag Team Championships against the Notice Me, Senpai team…I mean KAI and Kengo Mashimo, but it’s hard to tell the difference since that’s the kind of relationship these two would have together since KAI loves and respects him but the feeling isn’t so mutual for Kengo. 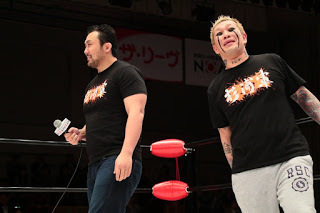 At the end of September, both Suwama and Shuji would suffer some minor injuries that would have them sidelined for a couple of weeks until they came back. Are the Violent Giants healed enough to retain the titles or will KAI and Kengo sneak in and grab those titles? I really do enjoy the dynamic between KAI and Kengo as a tag team and it’s mostly due to their chemistry and how they interact with one another since all KAI wants is Kengo’s approval and he won’t give it to him. Even when KAI went to go for a handshake, Kengo would just pat his head and tell him to go with his corner to pretty much tell him that he’s just his partner and nothing more. It might be just me but it felt like both Suwama and Shuji didn’t fully give it their all in this match for the most part and I think it’s due to them still being rather sore with the nagging injuries, but they would try their best for the most part, but it also didn’t feel like it at the same time which would affect the match very slightly and not enough to fully hurt it. Kengo and KAI would slowly start to work together due to having a common goal of winning gold in the match as you can see them working better, but Violent Giants are still the superior team in the match as they would start kicking it up to high gear to ignore the pain so they could just destroy their opponents in the match. 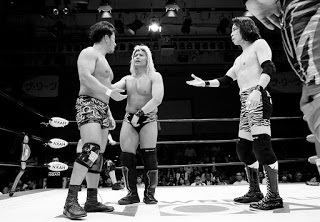 Both Suwama and Shuji would have their opponents set up for a Powerbomb, but KAI would flip Suwama over while Kengo would hit a Dragon Screw on Shuji as they start to get momentum back into the match. Shuji would get Kengo out of the ring to get him out as the two would hit a Double Powerbomb onto KAI for another kick out. Shuji would focus on Kengo as KAI and Suwama are alone in the ring to finish off the match as Suwama would try to go for the Backdrop Driver but KAI tries to power out of it until Suwama turned it into a Gutwrench Powerbomb. Suwama gets KAI back up for the Backdrop Driver and he hits it this time as KAI would kick out at two, but Suwama quickly picked him back up for the Last Ride and pins him to retain the titles. 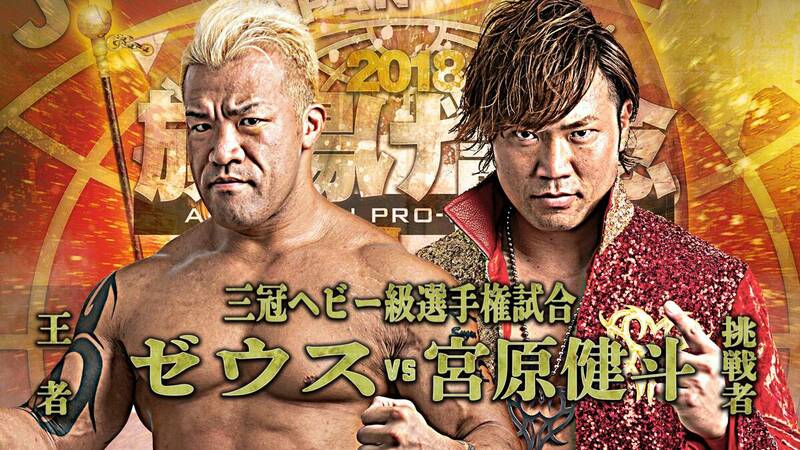 Review: It is now time for our main event of the show as Zeus is set for his second Triple Crown Championship defense against the ace of the company and winner of the Oudou Tournament, Kento Miyahara. The last time these two fought one on one, Kento was the champion and Zeus would beat him to finally win his first Triple Crown Championship. Zeus only had one defense in his name when he defeated Shuji Ishikawa and I was hoping he could have a couple more defenses under his belt before the two would cross paths again, but now it looks like it’s the time for them to fight. 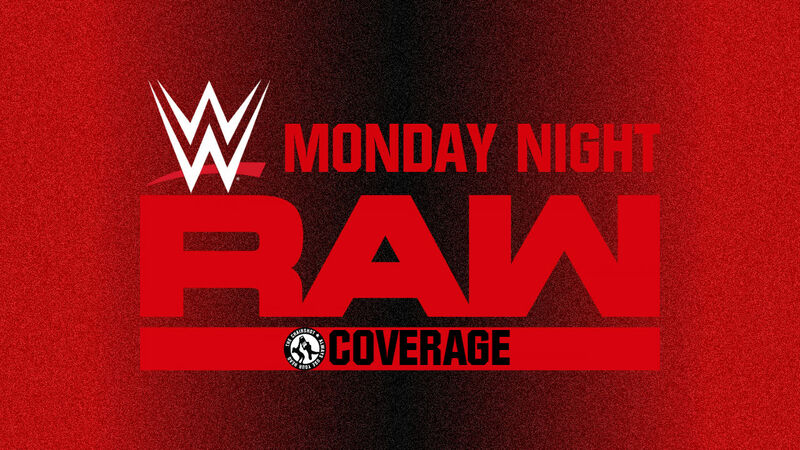 The outcome of this match is pretty crucial since it’ll decide the direction of the company going forward and how things would be booked for the upcoming months. Can Zeus defeat Kento twice in a row or will Kento become a four-time champion? I’m gonna bring up one issue people had before I go any further and people felt like the crowd not fully interacting in the match hurt the feel of it to make it not as important and I’m gonna have to disagree here since I feel like the fans were just too invested into the match that they would just wanna pay attention to it since this match is a big deal since you have two of their top guys fighting for the biggest prize to see who should actually lead the company into the future out of these two fan-favorites. 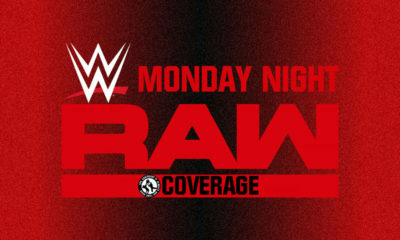 If I had to say one word to describe this match, it would have to be tremendous because that’s exactly what it was from the beginning to the end of it while the ring work was technically a masterpiece while the story of it was just breathtaking to give us a MOTY contender, and rightfully so. This match just a lot of emotion and intensity between the two of them from every grapple, every strike, and just any move that these two would deliver or counter, it all meant something and you can feel it just by watching this match. This match should show you what exactly Zeus is capable of with how well rounded he is for a guy his size that can throw you with his power while moving quickly like a cruiserweight to throw you off guard, Zeus is the real deal and eyes should be on him. Kento is also no exception as he’s proving why he’s arguably the greatest in Japan right with how talented he is in the ring, his swagger, and just overall work with these two men should be more than enough for you to follow this company. Zeus would start to show a bit of frustration towards Kento as he would start to pummel him with mean forearms while he was on the ropes as the referee would try to pull him off until he got shoved out of the way and Zeus continue the attacking, but he would eventually be held back by the referee again to calm him down a little which looked like it worked thankfully because that would’ve been a bad way to end the match. Kento started to get back into the groove of the match and use the energy of the crowd to get the strength to his a Blackout onto Zeus as he would hit his Shutdown German Suplex Hold as it looked like it’s the end, but Zeus would kick out of it and would be considered the first one to kick out of his finisher, leaving Kento speechless and the crowd going crazy! Kento would try to get him up for it the second time as Zeus broke free of the hold to hit a couple of Lariats and hits hit Jackhammer to try and put him away, but Kento would also kick out of it now as it looks like this match could go either way now! Both of these men were showing no surrender into the match and you can tell how important it is to win this match, but Kento would hit a few more Blackout’s and hits a second Shutdown German Suplex Hold as he pins Zeus to win his fourth Triple Crown Championship! I was hoping Zeus would win to hold a little bit longer, but it was a bittersweet moment since the match was incredible and Kento showed that he’s the one to lead the company. After the match, Kento would tell Zeus that they should help build All Japan together to help it grow into what it used to be and the two would shake hands as the crowd would start chanting not for Kento or Zeus, but for All Japan as a whole. It was an incredible moment to end the show and they represented King’s Road Style very well here. 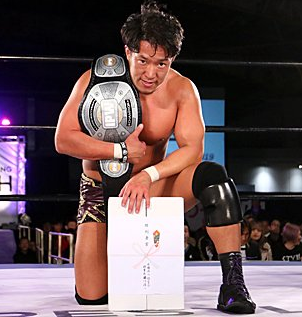 I cannot express enough for you guys to start getting into All Japan Pro Wrestling if you haven’t done so already, they’re a great product that doesn’t get much appreciation anymore and does deserve praise for the year they’ve been having for professional wrestling. Just go to ajpw.tv and subscribe to their service, it’s only $8 a month and it’s well worth the money, you’d be crazy to say no to it and it’s not hard to catch up and follow the product, you can go to the Champions Carnival or the Oudou Tournament to start it off and get familiar with their roster, do it now. So what will be next for Kento now that he is champion again? The day after the show, Kento would talk in a press conference about his next goal which is to go for the most title defenses in the company as Toshiaki Kawada holds that record with 10 title defenses while Kento was only able to make it up to eight with his first run as the champion, so now he looks to try and break that record this time and I wish him luck in that. 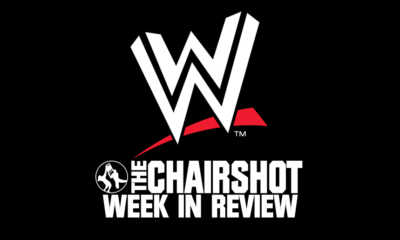 Overall: With the first two matches being mediocre, the rest of the show was enjoyable with different aspects from the matches to give us quality throughout the show. We have a MOTY caliber match to end the show and have our ace leading the company once again to new heights, but where those heights will take them next is the real question, but I’m supporting them for the whole ride.